Most people are used to using a free flow filter in their vehicle. 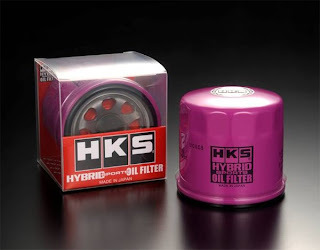 Although these filters do clean the oil it may not be sufficient enough to catch all the tiny particles that are flowing through the dirty oil. There are many micro sized particles that can be floating inside the oil that can cause permanent damage to your engine. Most if these particles are tiny pieces of metal or rust. HKS new concept oil filter which improves oil pressure drop and flow properties by approximately 30% compared to current sports oil filters. Large diameter `Super Intake Hole' and newly developed low resistance hybrid filter allows for low pressure loss. Engine Response is improved by reducing the load on the engine.